I think less of the outside city area, if it means a nod to including some the history (via monuments, etc). I agree, smaller is better for this map. Hope you keep West Philly. 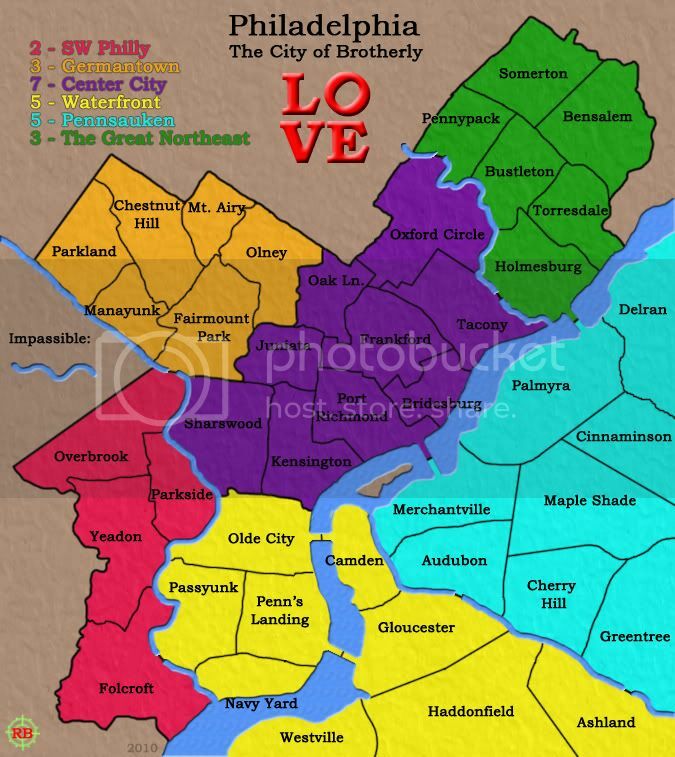 "Innnn West Philadelphia... born and raised...", plus Penn and Drexel, etc. Maybe just get rid of the purple yellow and red regions on the current map? I know nothing about Philly, but map looks interesting. the idea about historical Philly map sounds better as modern. how you can use bridges? and if will be map from past were these bridges build? How about adding The Girard Point Bridge near the Naval Base where I-95 crosses over the Schuylkill and Delaware River Merge. Still thinking about this, finally got a base image I like, and I've got some vacation time coming. Update to come in a week or so. I'm kind of getting back to this... Working hard on the gameplay, and keeping the map simple. Well you've got my interest. Maybe throw up a poll or something to secure interest? Sounds like a plan, poll created. Personally, I think, we are already starting to have enough standard gameplay maps. I mean, they're starting to repeat themselves. It's starting to be like we have a lot of instances of the same map with different skins on it... ok, the gameplay isn't exactly the same, but there's only so many medium-sized standard-gameplay maps you can make before all the options have been explored. So while I think that yes, CC could use more city maps and other smaller regional maps, I'd love to see some innovative gameplay designs. We just got a new XML feature, and while not every new map should instantly jump on it, it gives us some new tools to work with. The gameplay doesn't even need to be tweaked that much, just adding an interesting "twist" on it can be sufficient. TL,DR: I'd like to see the map go forward, but the more you can deviate from the "standard" gameplay model, the better. I echo natty. There's nothing that quite goes BAM I'm a sweet map like nothing you've ever seen before! Idk... City maps just feel... weak, to me. There are maps out there that allow you to conquer countries and even the world, a city map just doesn't appeal to me IMHO unless it has something to set it apart from all the other maps. Also with cities, most people aren't entirely familiar with the Philadelphia area, so it's like, "Yay I took over Maple Shade," but he has no clue what exactly he's taking over, if that makes sense. Anyways, I suggest experimenting with different gameplay things you can throw in. I'm wondering if making it a historical, as opposed to modern, map would be better, as I would expect it would be easier to implement gameplay features based off of historical events. Just a thought. I do give you credit, this draft is better than the one you had previously. natty_dread wrote: Personally, I think, we are already starting to have enough standard gameplay maps. I mean, they're starting to repeat themselves. It's starting to be like we have a lot of instances of the same map with different skins on it... ok, the gameplay isn't exactly the same, but there's only so many medium-sized standard-gameplay maps you can make before all the options have been explored. Look back to what barterer2002 said a while ago natty. Themed tournaments don't really a lot of city sized standard gameplay maps to choose from when putting their tournaments together. The only ones we have that are standard gameplay for cities are: NYC, San Fran, Puget Sound, (Seattle) Charleston, Vancouver, Sydney Metro, and Chicago. There are a couple other city sized regions but the gameplay for most of those is generally very complicated. And if you look at each of those maps I've mentioned they are on the larger size, except for San Fran and Puget Sound. An interesting though I had though... consider the well known underdog/blue collar mentality of Philadelphia. (see: Rocky) Something interesting I though might go really really well and make for very interesting gameplay, especially on team games, would be to alter the territory bonus to favor the player that is losing. i.e. As you lose territory, you GAIN armies. I kinda imagine a reverse territory bonus where being at 1, 2, 3 territories gets you what you would if you had most of the board. (in the current draft 42 territories total, you would get 13 armies for having 3 territories or less) But that would likely be too high at the start of the game so would have to be fiddled with. assuming it could work within the current XML. RedBaron0 wrote: The only ones we have that are standard gameplay for cities are: NYC, San Fran, Puget Sound, (Seattle) Charleston, Vancouver, Sydney Metro, and Chicago. I'm all for conquering Philly -- I live here -- but if you can think of even a little gimmick, that'd go far in justifying this map to the rest of the world. RedBaron0 wrote: An interesting though I had though... consider the well known underdog/blue collar mentality of Philadelphia. (see: Rocky) Something interesting I though might go really really well and make for very interesting gameplay, especially on team games, would be to alter the territory bonus to favor the player that is losing. i.e. As you lose territory, you GAIN armies. I kinda imagine a reverse territory bonus where being at 1, 2, 3 territories gets you what you would if you had most of the board. (in the current draft 42 territories total, you would get 13 armies for having 3 territories or less) But that would likely be too high at the start of the game so would have to be fiddled with. assuming it could work within the current XML. I wonder what a map like that would play like. If it works out wrong, it could lead to a whole lot of stacking. But if you can make it work (possibly with some counterincentive collectible bonus?) it would certainly be different. Wow, I think this is a great idea... if you can make it work. My interest in this map just skyrocketed. There would still have to be some incentive to attack, right? Not sure exactly how this could work, but you definitely have my attention. Well that would certainly be different. Baron, I think it's a great idea. This map is long overdue. A couple of friends and I were trying to come up with ideas for Philly maps, we just don't have the PhotoShop skills. We were thinking about a Philly map based on Police districts and Police divisions, but I like what you came up with better. Philly is a city of neighborhoods, so it's nice to see the map represented that way (speaking as a long time resident). If you need any help with neighborhood names send me a PM. Just don't forget kensington, fishtown, port richmond, or mayfair. Location: The Streets of Philly! Now that I have looked at the map a bit more, I have some comments/concerns about the territories. Old City extends from Penn's Landing (which is a sliver of land on the coast of the Delaware River) to about 6th street, which is the eastern third of what you have. Center City makes up the other two-thirds of what you Call Olde City. I suggest splitting this up, but if you don't want to it should be called Center City because that is the more encompassing name. I also think that including the Center City/South Philly geographical region and the southern parts of New Jersey in the same bonus region is a stretch as they are very different places. For a map with some very large bonus regions, I see no problem splitting them up. Also, University City deserves a territory IMHO. If you wanted, you could easily add a few other territories to the red region and split it up into the more traditional neighborhoods of West Philly and SW Philly. I just noticed the purple region is called Center City... I have never hard of anything north of about Spring Garden St. referred to as Center City. The region seems to cover a few small neighborhoods, but I suggest just calling it North Philadelphia. RedBaron0 wrote: An interesting thought I had though... consider the well known underdog/blue collar mentality of Philadelphia. (see: Rocky) Something interesting I though might go really really well and make for very interesting gameplay, especially on team games, would be to alter the territory bonus to favor the player that is losing. i.e. As you lose territory, you GAIN armies. I kinda imagine a reverse territory bonus where being at 1, 2, 3 territories gets you what you would if you had most of the board. (in the current draft 42 territories total, you would get 13 armies for having 3 territories or less) But that would likely be too high at the start of the game so would have to be fiddled with. assuming it could work within the current XML. There you go Baron, there you go I think I know of a way to make the XML work the way you want it, so that shouldn't be a problem. Just the stacking is what I'm afraid of, same as ED. carlpgoodrich wrote: Now that I have looked at the map a bit more, I have some comments/concerns about the territories. Old City extends from Penn's Landing (which is a sliver of land on the coast of the Delaware River) to about 6th street, which is the eastern third of what you have. Center City makes up the other two-thirds of what you Call Olde City. I suggest splitting this up, but if you don't want to it should be called Center City because that is the more encompassing name. I know, I'm kinda looking for the balance on that front, names are just that, names. The traditional break up of the neighborhoods of Philly just doesn't really lend itself to gameplay. (See the earlier drafts) Certainly some of the territory names you've mentioned I'll work in there, but some things will get lost based on territory size, and the break up the bonus regions. I can go a little larger on territory count. I'm just afraid the map might start breaking down into a lot of small bonuses. Victor Sullivan wrote: There you go Baron, there you go I think I know of a way to make the XML work the way you want it, so that shouldn't be a problem. Just the stacking is what I'm afraid of, same as ED. I'll research into the XML, see if it's codeable, it should be, especially if it only effects when you have say 1, 2, or 3 territories. I'm figuring everything is still basic above the 3 territory total. If you have 3 territories or less, you'll receive more armies, not an amazing amount, say 5-10-15 armies. And if you're on 3 territories, you'll get less than if you have 2 territories, etc. Basically you'll have a chance to get back in the game, but the odds are still long in most standard games, considering you'll be staring down a ginormous stack, where an extra 5/10/15 armies ain't gonna save your life. It will be quite useful in team games, assassin, and 1v1 games I would think. I do see the stacking issue... I might think about putting in the losing condition here to add intensive for attacking. With the XML, just have the bonus for having only one territory override the bonus for having 2 then 3 territories, if that makes sense. RedBaron0 wrote: I'll research into the XML, see if it's codeable, it should be, especially if it only effects when you have say 1, 2, or 3 territories. I'm figuring everything is still basic above the 3 territory total. If you have 3 territories or less, you'll receive more armies, not an amazing amount, say 5-10-15 armies. And if you're on 3 territories, you'll get less than if you have 2 territories, etc. I like it. It's unique and sounds pretty playable. And it's certainly doable with the XML. Victor Sullivan wrote: With the XML, just have the bonus for having only one territory override the bonus for having 2 then 3 territories, if that makes sense. Surely you mean the other way around. The 2-territory bonus overrides the 1-terr. bonus, but its bonus value is lower; likewise, the bonus for 3 overrides the bonus for 2. You'd also have to have a 0-value 4-territory bonus to override the 3-territory bonus. RedBaron0 wrote: I do see the stacking issue... I might think about putting in the losing condition here to add intensive for attacking. Probably not necessary if everything past the 3 point is normal. Thanks for correcting me, ED, yes, that's what I meant. Alright, looks pretty convincing to me. Philly pretty much as it is, plus an underdog clause. I'll punch up some numbers make some tweaks and probably put in a brief.